The realm of 3D scanning, once a fantasy, has now metamorphosed into an undeniable phenomenon, 3D scanning industry, endorsed by a barrage of conventional and off-beat application arenas, stands to gain a superfluity of fame and fortune, that is quite overtly conspicuous from the extensive profiling of applications that 3D scanning caters to. While the technology has proliferated across the medical, military, aerospace, manufacturing, and architecture domains, the latest addition to this end-use array is archeology, or rather, the discipline of cultural heritage. 3D scanning market, according to expert opinions, is in a considerably paramount space today, given that researchers have been experimenting generously with the technology across off-beat spheres. Speaking of experimentation, 3D scanning industry recently witnessed the birth of a phenomenal initiative called OpenVertebrate. The project, a multi-million-dollar venture, has officially been launched at the beginning of September, with the help of a generous endowment of USD 2.5 million from the National Science Foundation. Launched with an aim to exploit the 3D technology for scanning the skeletons of over 20,000 types of vertebrate over the next four years, OpenVertebrate is likely to mark the genesis of a significantly unorthodox application arena in 3D scanning market. 3D scanning industry, as is observed, has found a slew of applications in research projects concerning artifacts and historical sites. This change of events, it is predicted, will bring about a mammoth transformation in the way in which 3D scanning market is perceived. The amalgamation of 3D scanning and 3D printing technologies will enable the archetype of real objects without having to use traditional plaster casting techniques. In effect, the final digital 3D model of delicate cultural heritage artifacts or objects in museums can be easily delivered as an input to a rapid prototyping machine, by means of which an actual resin replica of the original object would be procreated. This methodology seems to be as fascinating in practice as it is in theory, and when legitimately commercialized, will bring about a transformative upheaval in 3D scanning industry. The affirmation of scientists regarding the humongous application scope of 3D scanning industry is quite true indeed. However, a concise overview of three principal sectors that utilize 3D scanning has been outlined in the paragraphs to follow, which provides an in-depth understanding of the far-reaching effects of 3D scanning market in various end-use domains. 3D scanning and printing are actively pursued for creating precise prototypes and end-use parts for defense applications. A 3D laser scanner ensures that reverse engineering can be done within the least time possible, and much faster than traditional methods, on the basis of which it has been aptly concluded that 3D scanning market is inclusive of a widespread end-use spectrum. This technology is principally used in the aerospace domain for manufacturing precision components, right from designing engine components and airframe equipment to sculpting cockpit areas and aircraft bodies. Driven by the force to minimize downtime, the aerospace domain uses 3D scanning to capture data and operate the same with CAD software, thereby helping to reduce human error, maintain production schedules and meet deadlines, which will eventually stimulate 3D scanning industry size from aerospace applications. Of late, the trend of outsourcing the works to an established 3D scanning service helps aircraft manufacturers focus on core competencies, which provides even more of a lucrative avenue for 3D scanning market giants. The AMRDEC (Aviation Missile Research Development & Engineering Center) has recently endorsed ATOS blue light 3D scanners to upscale their inspection standards and adaptive machining applications. Given that high quality blue light 3D scanners can instantly obtain 3D data points per scan and are designed to decode the results within the software for robust process optimization, it comes as no surprise that the deployment of these scanners led to cost savings of close to USD 100 million for the organization. ARMDC’s usage of 3D scanning to precisely measure small to large components by delivering quick computer models within minutes is certain to revolutionize 3D scanning industry trends from defense applications. The latest trend proliferating aerospace-based 3D scanning market is that of using HD 3D CT scans of luggage to increase the speed of security checks and monitor terrorist or illegal activities at airports. The use of 3D CT scanners that deliver numerous images with an all-round spinning camera is likely to extensively enhance security procedures, inherently impelling 3D scanning industry. The advent of 3D technology has transformed the medical sector in more ways than one. 3D scanning, awash with its incredible throng of perks, is used across the healthcare domain for capturing HD, color 3D models of complex facial structures that help to plan and track treatment outcomes, monitor healing, and create customized masks for facial complications. It is imperative that 3D scanning industry players collaborate amongst themselves to brainstorm a slew of innovative products for rapid data capturing and accurate measurement. The recent announcement by NovaCopy, Inc., a leading firm in 3D scanning market, regarding the launch of its Health Care Partner 3D Scanner - admirably the sole handheld 3D scanner for human body scanning is an instance of the aforementioned fact. The innovation, formulated on the Go!SCAN 3D technology, delivers portability and superior accuracy and will lay the foundation of high-grade contemporary product manufacturing in 3D scanning industry from medical applications. 3D scanning market has also been penetrating dental applications with remarkable gusto. The contribution of superior 3D integrated scanners toward a highly strengthened dental ecosystem is bound to increase the growth avenues for 3D scanning industry. Primary end-users within this sub-vertical that massively deploy 3D scanning include dental labs, dental clinics, orthodontic labs, orthodontic clinics, and implantology labs. Recently, with an aim to provide patients with the best treatment outcome possible, Medit, a 3D scanning market player launched the Identica T500, a quick-scan scanner incorporated with a high-speed camera & projector and a highly efficient algorithm. In an era embroiled by up-to-the-minute developments, the utilization of 3D scanning holds more value than is anticipated. 3D scanning industry has been pervading the healthcare space with as much agility as it is pervading the clothing sphere. The fact that 3D scanners are non-invasive, easy to use, and cost lesser makes them highly vulnerable to be used for large-scale epidemiological surveys and clinical applications. Considering the present scope of 3D scanning in the medical space, it would not be incorrect to state that 3D scanning market is set to emerge as one of the most opportunistic business arenas of recent times. Entertainment falls among the most dynamically evolving spheres of the 21st century. Endorsed with an aim to transform fantasy and science fiction into reality on the celluloid, movie makers have been going the whole hog to provide the audience with a rich, all-encompassing entertainment experience that will be the chief driving force behind 3D scanning market growth. 3D scanners are used in the entertainment domain to create digital 3D models for video games and movies (virtual cinematography). They are heavily utilized for scanning individual people to create character doubles and huge landscapes to obtain near-perfect replicas for video games. The applicability of 3D scanning industry in entertainment is evidenced quite vividly from the developments underlining this terrain. Recently, EA Sports made it to the front page for deploying a brand-new laser scanning technology at the Augusta National Golf Club for laser scanning every hole featured in the game. This arrangement is expected to provide players with the best digital representations of the Tournament and Par 3 courses there are, right up to the minutest details – a fact that may have a sizable impact on 3D scanning industry share from the entertainment genre. Using character doubles for movies has been the norm since ages now, however, lately, the procedure is being accomplished through 3D scanning, subject to the nearly flawless creation, extensive detailing, and lesser time consumption. The considerably huge expanse of 3D scanning for creating historic or renowned character doubles is certain to augment the growth map of 3D scanning market from entertainment. Another recent announcement that demonstrates the extent to which 3D scanning industry has penetrated the entertainment sector is the Panasonic launch of the 3D Scanning Booth at the opening night of the ‘Kabuki Lion: The Adventures of the Mythical Lion’. This innovative technology apparently provides guests with the convenience of watching their animated figurines dancing like the Kabuki actor and is one of the most advanced developments that 3D scanning market has witnessed in recent times. The ground-breaking innovations that 3D scanning industry is replete with, provide quite a reliable testimony of the all-encompassing application scope of this business sphere. Three-dimensional technology, as is evident from its illustrious public esteem, is validating the claims made by experts regarding its projected preeminence across myriad sectors. By extension, 3D scanning market is also all set to revolutionize the 3D space in terms of accuracy, precision, and efficacy. The commercialization of 3D scanning industry is still at its infancy, on account of the fact that the deployment of this technology is inclusive of numerous prerequisites. 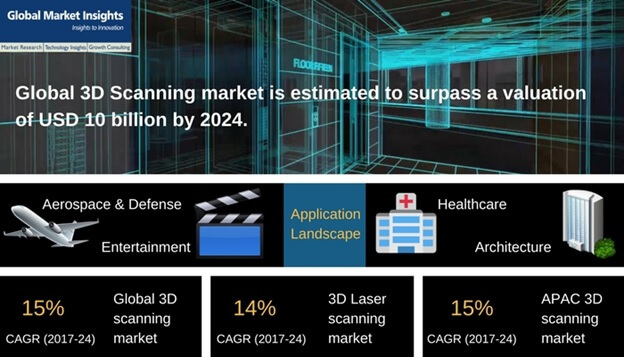 Nonetheless, judging by the pace at which it is penetrating a multitude of applications, it is unquestionable that 3D scanning industry will chronicle itself amidst the most remunerative business spaces of recent times, with a target revenue estimation of USD 10 billion by 2024.